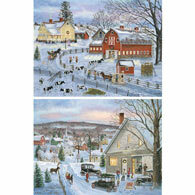 Dairy Farm Winter is a 300 piece jigsaw puzzle designed by artist Bob Fair. Cows are lining up to return to the barn for milking on a winters day. 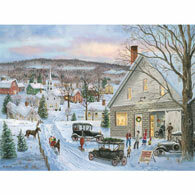 Dad arrives with a freshly cut Christmas tree by sleigh to decorate for the upcoming holidays.